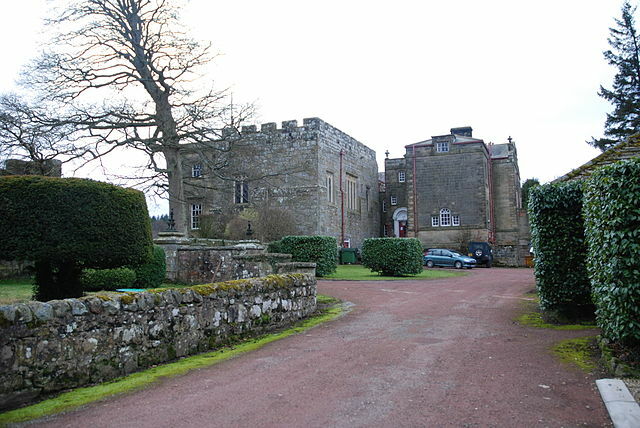 Notes: Lemmington Hall is an 18th century country mansion incorporating a 15th century tower house, situated near Edlingham, Northumberland, England. It is a Grade II listed building. The original tower house built for the Beadnall family in the early 15th century was a four storey construction which was reduced in height in the 17th century when Nicholas Fenwick ( Mayor of Newcastle 1720) converted the building into a country house. Despite substantial alterations and improvements by architect William Newton in the late 18th century, the property had become a roofless ruin by the end of the 19th century. It was completely restored by Sir Stephen Aitchison (see Aitchison baronets), who acquired the ruinous property in 1913. In 1927 Aitchison bought an 80-foot-high (24 m) column, designed by Sir John Soane dedicated to the memory of members of the Evelyn family of Felbridge, Surrey, which he dismantled and re-erected in the grounds at Lemmington. In 1825 the property was acquired by William Pawson of Shawdon Hall (High Sheriff of Northumberland in 1826) and in 1947 was converted for use as a convent for the Sisters of the Sacred Heart. More recently the house has been used as a residential care home. The hall has recently been renovated; it is under ownership of the Ruff family. The Ruff family also own a selection of animals on the Lemmington Hall estate including peacocks and peahens.